Last month I started learning kivy, kivy is an exciting Python framework for building rich interactive applications ready to run on different platforms, currently Linux, Windows, IOS and Android are supported. The framework supports accelerated graphics for smooth transitions and a better user experience, different input methods are also supported making kivy an ideal choice for the production of cross-platform mobile-ready applications. Kivy documentation is pretty good and on the project website you can find a nice tutorial to get you started quickly. I’m mainly a web programmer and I’m not new to GUI programming with GTK or QT but kivy approach is quite different and after a while I started to search for a gentler introductory text. 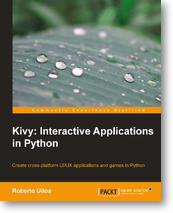 While I was searching for a good tutorial, I came across the book Kivy: Interactive Applications in Python in Python. This book is a great starting point for those who are willing to begin kivy programming, it covers all the most important topics and basic concepts, which are well explained and full of heavily commented examples that focus on the realization of a working application, simple but effective for learning by doing. I highly recommend this book, I mostly appreciated the examples about layouts and coordinates traslations between widgets and parents and the event management system.